ONLY THE MAIN MANAGER ON EACH ACCOUNT CAN ADD & SET PERMISSIONS FOR ADDITIONAL MANAGERS – and the MAIN MANAGER can view other managers’ usernames (not passwords). Each WhenToWork account has one Main Manager (the manager who created the account) and can have any number of additional managers who can be limited in what they can see and do when they sign in. The main manager will see the Add/Edit Manager page on that SETTINGS tab. 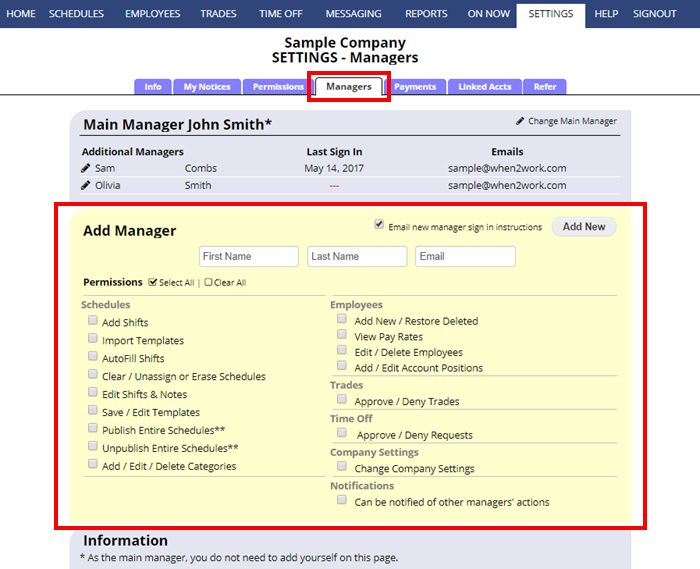 Multiple managers can be signed in at the same time and make changes if they are using their own manager sign in. For security reasons, SIGN INS SHOULD NEVER BE SHARED. Each manager has a unique manager username and password (IN ADDITION TO any username & password they may have to sign in as an employee) and can perform only the functions that the Main Manager allows. Managers can sign in and filter their schedule views to only show certain Categories, Positions, Group of Positions, etc. but you currently cannot restrict them from seeing particular positions. For example, if their permissions allow them to add shifts – then they can add shifts for all Positions. If managers must be restricted to only see and schedule certain departments or locations, you may want to create separate WhenToWork accounts if no employees are shared between departments/locations. After a manager is added, you can send them their login information again any time. You can use the “Email sign in instructions” link to email them their manager username and password which will be different from any employee sign in they may already have. Note that any user can also retrieve all their login information from our sign in page at any time.